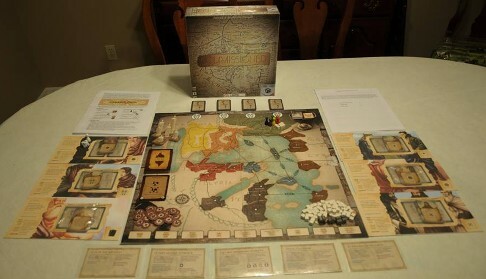 Commissioned is a cooperative board game for 2–6 players with a historical theme based on the early spread of Christianity throughout the Roman Empire. The game was designed by Patrick and Katherine Lysaght, who will be publishing the game in late 2015 or early 2016 via their company, Chara Games, LLC. Thanks to Sam Healey's invitation, I had the good fortune to meet Patrick Lysaght at Origins 2014 and playtest Commissioned. Since then I've had the opportunity to playtest the game some more and communicate with Patrick. Even though I haven't published a board game, I've been playing games and studying their design for decades. I can tell you that Patrick really understands how games are put together; and more important, he knows how to put together a good game. Every time I thought there was something wrong with or missing from the game, it turned out I had overlooked or misunderstood a rule. Patrick and Katherine obviously put many hours of thought and testing into making this one of the most well-designed games you'll find. Unfortunately, despite recognizing the game's top-notch design, game publishers declined to publish Commissioned because of its theme, believing it to be unmarketable. I disagree with that conclusion. If the game were rethemed as a game of space exploration, for example, the game mechanisms would make little sense. The game mechanisms and sequence of play were all conceived in the context of the game's theme. I would argue that retheming the game would undermine the game. The game is historical in nature and doesn't proselytize. There was a time when movies like Ben-Hur and The Greatest Story Ever Told could be enjoyed by all. Commissioned is the Ben-Hur of board games, serving a hitherto ignored market segment while at the same time appealing to all types of board gamers. In order to build awareness of Commissioned, I will be writing a series of articles about the game, starting with a descriptive review of the game. I say descriptive because I will attempt to remain neutral, omitting my subjective impressions to the extent possible. I will then try, time permitting, to provide updates describing my experiences during my work translating the game into a computer game. This is an April 2015 photograph of an advanced prototype of Commissioned. It is not necessarily representative of what the final game will look like. Commissioned images are Copyright © 2015 Chara Games, LLC. Used with permission.